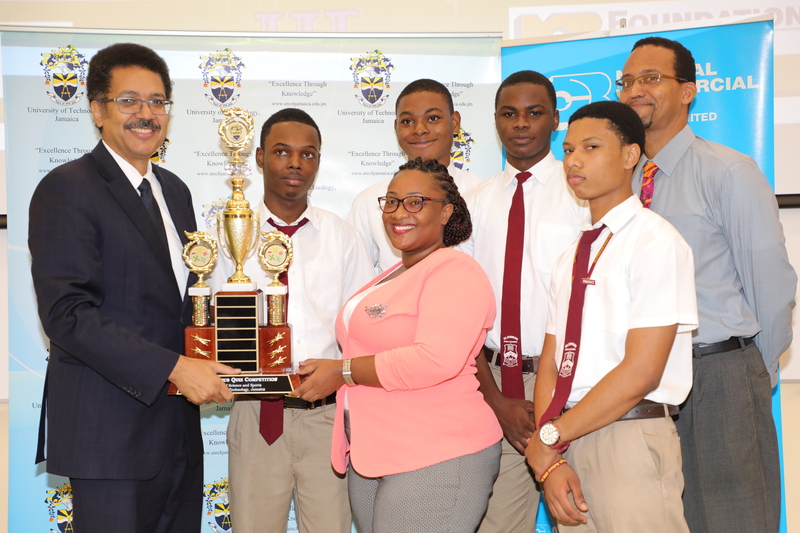 Glenmuir High School Wins Inaugural UTech, Jamaica Mathematics Quiz Competition — UTech, Ja. Prof. Stephen Vasciannie, CD, President, University of Technology Jamaica presents the first place trophy in the UTech, Jamaica Inaugural Mathematics Quiz Competition held today, Thursday, November 30, 2017 at the Univeristy’s Papine campus to Glenmuir High School students and their coaches. Accepting the trophy from left are, Miss Oneika Anderson, Mathematics Teacher and Coach, Jabari Glaves, (back row from left) Phillip Lloyd, Eric Dixon, Javier Bryan, and Mr. Andrew Gordon, Mathematics Teacher. Prof. Stephen Vasciannie, presents the second place trophy to Immaculate Conception High School team. 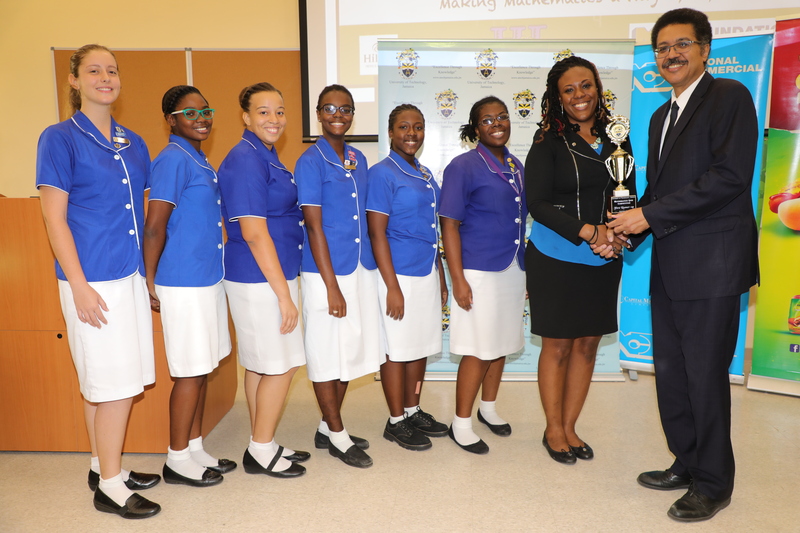 Accepting the trophy are Ms. Karla Guthrie, Mathematics Teacher/Coach and students from left, Katana Finlason, Danielle Morgan, Jamelia Gordon, Athena Pagon, Sharmalee Wright, Anika Duffus. In an impressive show of intellect and mathematical prowess, student teams from Glenmuir High and Immaculate Conception High schools competed valiantly for the winning trophy in the finals of the inaugural University of Technology, Jamaica Mathematics Quiz Competition hosted today, Thursday, November 30, 2017 by the School of Mathematics and Statistics (SOMAS) in the Faculty of Science and Sport at the University’s Papine campus. At the end of the regulation time for the match after three exciting rounds, both Glenmuir High School and Immaculate Conception ended in a tie of 13 points. It was the tie-breaker question posed by Quiz Master, Mr. Kevin Williams, Lecturer, SOMAS who asked - “When asked how old she was, Beth replied, in two years time I will be twice as old as I was five years ago. How old is she?” that gave the Glenmuir High team the edge when Immaculate answered incorrectly and lost two points. The well-deserved victory went to Glenmuir High School with a final score of 13 and the runner-up trophy to Immaculate Conception with the final score of 11 points. Campion College finished in third place. The winning school received a trophy and cash prize of $150,000. The second place school also received a trophy and cash prize of $100,000. All participating schools received a gift basket. Cash prizes and gifts were also presented by sponsors Reggae Jammin/Hamilton’s Smoke House, NCB, H and L Ultimate Touch Promotions Limited, Hilton Rose Hall Resort and Spa and Yello Media Group to students and their coaches. UTech, Jamaica’s Mathematics Quiz Competition held under the theme, “Making Mathematics a Way of Life” is part of the University’s thrust to promote and develop the awareness of mathematics as a tool for problem solving across disciplines and to generate a cultural change and love for Mathematics in Jamaica and the wider Caribbean. The Mathematics Quiz Competition which began with the preliminary round on November 18 is open to high schools by invitation. The quiz covers all the curriculum of the CSEC and CAPE Mathematics Level 1. Each participating school is allowed to register a maximum of three teams comprising no more than three students on each team. The competition rounds consisted of multiple choice and structured questions. President, UTech, Jamaica, Professor Stephen Vasciannie, CD in his welcome congratulated all the teams from the participating 21 high schools and specially commended the five semi-finalists who competed in the semi-final round on Wednesday, November 29 - Campion College, Herbert Morrison Technical High, Wolmer’s High for Girls and finalists Immaculate Conception High, Glenmuir High. He specially acknowledged the role of teachers who accompanied, guided and inspired their students. “I think this competition has put our schools in a very positive light and I commend them for that. 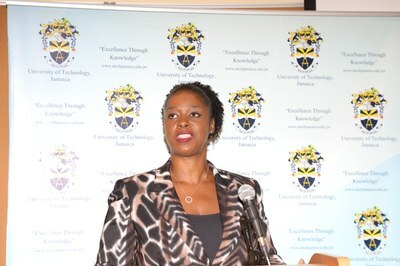 It has also put UTech in a very positive light and I commend the organisers for that,” Professor Vasciannie said. The President heaped praises on the team from the Faculty of Science and Sport (FOSS) led by Dean, Dr. Kamilah Hylton, Vice-Dean, Mr Patrick Williams, Head, School of Mathematics and Science, Lecturer and chief competition organiser, Mrs. Ave Maria McIntosh, the judges, time-keepers, scorers and other members of faculty and administration who were involved in organising the successful inaugural Mathematics Quiz Competition. He also thanked sponsors for their support. Pointing out that a number of graduates of UTech, Jamaica’s School of Mathematics and Statistics are now serving as Mathematics coaches at the secondary level, the Dean expressed the University’s intent to continue that tradition of working with educators and the Ministry of Education in inspiring students to pursue Mathematics. Dr. Tamika Benjamin, National Mathematics Coordinator in the Ministry of Education, Youth and Information speaking at the finals of the University of Technology, Jamaica Inaugural Mathematics Quiz Competition. In congratulating the participating students, Dr. Benjamin encouraged them to continue to pursue their love of Mathematics, pointing out that there are wide and lucrative career opportunities for persons trained in Mathematics. Mr Patrick Williams, Vice Dean in moving the vote of thanks acknowledged President Professor Stephen Vasciannie for “planting the seeds of the idea” for the Mathematics Quiz Competition among high school students from across Jamaica. Mr Williams acknowledged the contribution of all persons within the faculty who subsequently enabled the successful fruition of the initiative and expressed hope for an even better renewal of the UTech, Jamaica Mathematics Quiz Competition in 2018. WINNERS: Professor Stephen Vasciannie, CD (centre), President and Dr. Kamilah Hylton (4th left, front row) Dean, Faculty of Science and Sport (FOSS) congratulate the winning teams in the University of Technology, Jamaica’s Inaugural Mathematics Quiz Competition held today, November 30, 2017 at the Papine campus. Sharing in the happy occasion are second place winners from Immaculate Conception High School: (Front row, from left) Anika Duffus, Sharmalee Wright and Miss Karla Guthrie, Coach and (back row, left) Katana Filason, Danielle Morgan, Jamelia Gordon and Athena Pagon and winners of the competition Glenmuir High School: Miss Oneika Anderson, Coach, Jabari Glaves (right), Javier Bryan, Phillip Lloyd and Eric Dixon and members of UTech, Jamaica’s administration Mrs. Ave Maria McIntosh, Head, School of Mathematics and Statistics (SOMAS), Mr. Kevin Williams (back row, 2nd left), Lecturer, SOMAS and Mr. Patrick Williams, Dean, FOSS (back row, 1st left).